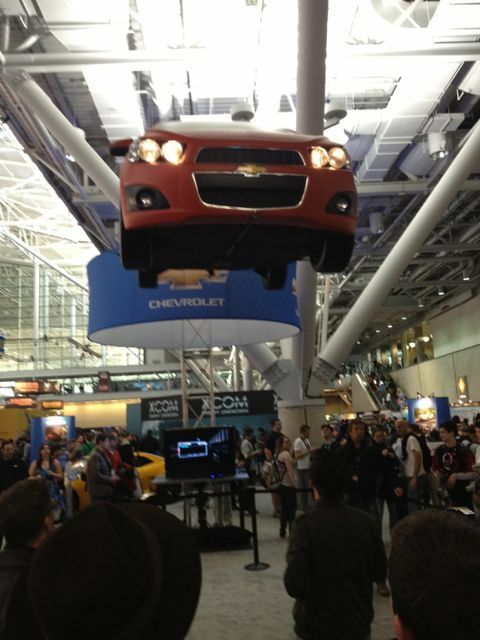 This weekend I spent three days at PAX East. PAX stands for the Penny Arcade Expo. PAX is a convention / exhibition of games and gamers. It’s also something of a movable-feast nerd mecca. This year, like last year, it was at the Boston Convention and Exhibition Center (BCEC) – the biggest venue in town short of the football arena. If the rumors are true, they sold out the entire space for Friday and Saturday, and had some tickets at the door on Sunday. I heard numbers like “20,000 attendees.” I have no idea whether that’s at all accurate or if it’s inclusive of the exhibitors and staff. In any event, it’s large. I started seeing PAX badges on the trolly that I take into town. I decided to walk from South Station to the site because of the mass of gamers waiting for the shuttle bus. PAX briefly deforms the mass transit user profile of Boston. Is that big? I think it’s big. Games and gamers have gained much broader acceptance in the past decade or so. Computer games in particular used to be the realm of pasty faced basement dwellers. Now, the gaming console is a staple of the main feasting halls where the cool kids dine and dance. Musical / social beat matching games like Rock Band and Dance Dance Revolution have added athletic and group participatory aspects to games. Phone based social games like Lexulous and Draw Something mean that adults can and do play parlor games with their parents and siblings before bed – maintaining a social connection sorely lacking since the Great Error of single-family housing in subdivisions of the 50s. 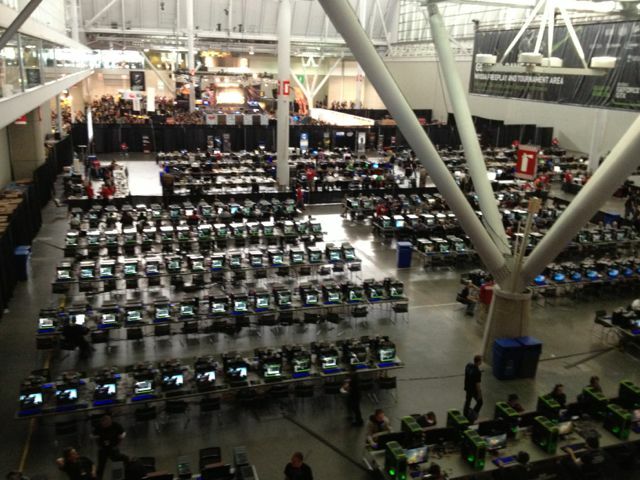 PAX brings all of those people together in a massive convention hall. I don’t want to sound like too much of a shill here, but I’ll go for it anyway: I see in PAX a microcosm of a different and better sort of society. The core of it is that PAX people (at PAX – I have no idea how they act at work or in their daily lives) are, by and large, accepting of each other in a way that I do not usually see in broader society. 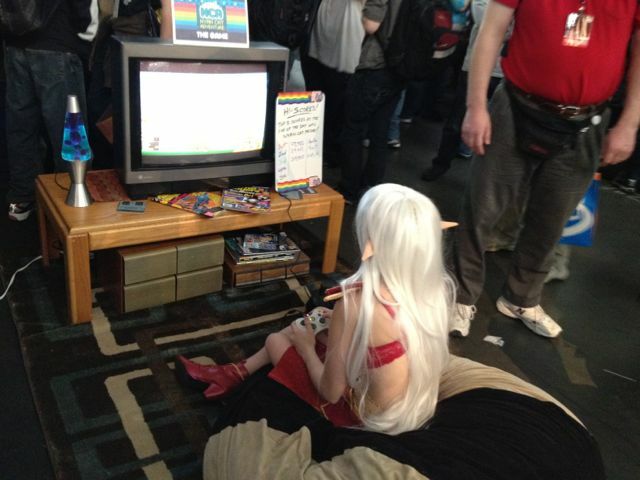 Everyone knows at some level that when you show up at a gamer convention, there will be gamers there. Most of us pasty faced basement dwellers figured out early in life: Everybody is weird. Everybody, without exception, has a freak flag that is flown on occasion. Each of us requires special handling from time to time. Most of us have read Stranger in a Strange Land and felt its uncanny truth. Hell, there are entire subgenres of scam built around the universal feeling of being just a bit different – just a bit outside. There’s also a flavor that I picked up in the Martial Arts. There is a default to humility because in all likelihood, the person you just met is really very good at whatever game they do play. Sure, I’ll take you apart at Gears of War – but I don’t even know how to work the controls for … what are you playing again? It looks really cool. Also? Rad costume, bro! So we had 20,000 people, give or take, all packed into a convention center – and we were all weird together. More important was that the vast majority of us are used to having weird friends. Even the superficially normal people who showed up had to admit that – yeah – they like to play the same games as the geeks. So what does that mean in practice? The exhibitionist extroverts wear costumes and pose for pictures with each other. Introverts like me quickly tire out and then wind up in a safe little corner watching from a safe distance. There’s a dance stage where people who want to play the dancing games do so. People who want to watch, watch – and we applaud even when someone doesn’t know what they’re doing. So we’ve got something like 20,000 people doing what they actually want to be doing, and accepting what other people are doing – for a whole weekend. It feels fundamentally different from my day to day interactions with most people most of the time. We can laugh and say “that’s why they have to pay you to be at work,” but I fall back on Jane Mcgonigal‘s comment last year: “The opposite of play is not work. The opposite of play is depression.” Obviously we cannot play games all day every day – but bringing a gamers attitude to day to day life might help a lot of people a lot of the time. Sure, there’s a corporate flavor to the expo floor. That’s where the funds are centered. We’re still in an economic model where large amounts of resource are pooled and re-distributed via corporations. In 2012 you don’t get to rent the BCEC unless you have the resources of several major corporations at your back. Don’t like Microsoft? Fine. Go ahead and dislike Microsoft. However, they did rent out a thousand or more square feet of the convention floor at full fare to host your party. Yes I know that you paid admission. You think that your measly registration pays for the hall? You thought perhaps that PAX is expensive for you to attend? Let me assure you that there would not be a party there without the corporate sponsors because none of us could afford to throw it. Anyway, I wandered the floor, I sat in a corner and watched the exhibitionist extroverts. I caught some music in the JamSpace. I picked up one new game for my phone. I played a couple of console games that I’ve wanted to check out. I even watched some friends play tabletop role playing with many, many dice. I wound up tired but happy. PAX was fun. Would attend again.